These images were scanned from a scrapbook kept by Beth Whitney Thomas's parents, Si Whitney DS19, director in the 1940s, and Eunice Whitney. Bonham Campbell earned a BS and MS in engineering, served in the Navy during WW II, in Washington, DC, then at the China Lake Naval Ordnance test center, before returning to DS about 1947 as instructor and eventually DIrector. Bonham and Jane's son Alan was born at DS (or in the car on the way to Bishop, per Holloway family lore), in 1950. 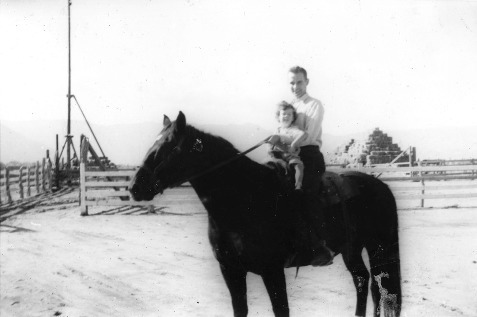 Simon and Eunice Whitney, “Bonham Campbell on horse with daughter Patricia,” Deep Springs Archive, accessed April 21, 2019, http://archive.deepsprings.edu/items/show/584.